I always wondered how well Gefen's line of switchers would work in the real world. 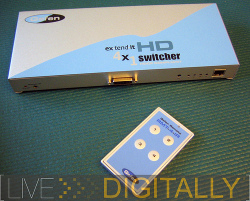 Gefen used to make switch boxes for the broadcast world which began finding their way into HDTV households as connectivity formats increased without a commesurate number of inputs on TVs or receivers. 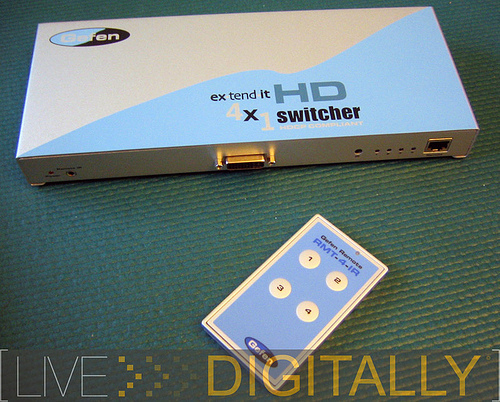 Lately, some of Gefen's products have been picked up by home theater distributors, and Jeremey Toeman over at LIVEDigitally gives a 4 x 1 unit (4 HDMI inputs, 1 DVI output) a strong review. One side note: simple boxes that switch analog formats can be had for $29.99 at Radio Shack, so there's often sticker shock when people see what looks like a simple product with a price tag 10x higher. Gefen's 4 x 1 sells for $300, and while there are certainly healthy margins built into the price tag, it is not a simple mechanical device like that speaker selector box. For now, most of Gefen's boxes have been sold to professionals (either in the broadcast industry or custom installers), but as its products move into retail, the company should spend a few dollars on packaging and POS (Point Of Sale) marketing materials extolling the virtues of passing along HDCP signals, bandwidth specs, and pretty pictures of the innards. Monster does this to great effect with their entire product line. Of course, the HDMI or DVI cables for each of the devices are also much more expensive than RCA video cables, too. Consumers can easily double the price of the Gefen switcher by the time they're done setting up a system (and they thought they blew the budget on the big plasma TV...). HD connectivity can be pricey.